ARTICLE: Fantastic Facelift - The Colonial Fox Theatre in downtown Pittsburg is getting a new face . . . ARTICLE: Fox Theatre hosts annual ghost tour, welcomes performing spirits . . . ARTICLE: Most visible phase of Colonial Fox Theatre renovations set to begin. EVENT: Chamber Coffee November 29 at 8 a.m. EVENT: Friday Flix movie: The Polar Express! November 9, 5:45 p.m. EVENT: Paranormal theatre tours! Saturday, October 27 at 8:00 pm. EVENT: Friday Flix - "The Goonies" 7:00 p.m. EVENT: August 10 - Friday Flix: "Toy Story 3" starting at 8:45 p.m. ARTICLE: "Historic Pittsburg theatre $25,000 closer to goal"
EVENT: Chamber business after hours - Tuesday, June 19 from 5 pm - 7 pm. EVENT: June 15 see Friday Flix "E.T. The Extra Terrestrial!" ARTICLE: "The Colonial Fox - Magic in the air"
NEWS: "A Glimpse inside the Colonial Fox Theatre"
EVENT: Bluegrass, Brew, BBQ & You! June 8th 6:30pm - 9:30pm. RSVP by June 4th. EVENT: Friday Flix Series begins with "The Sting" on May 18! ARTICLE: "Downtown the Destination of Choice" Read More. ARTICLE: "Colonial Fox hosts KHTA" Read more. EVENT: April 25 the Kansas Historic Theatres Association meets at the Colonial Fox Theatre. See photos. 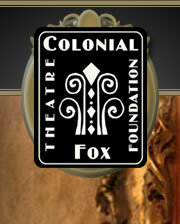 ARTICLE: "Colonial Fox Theatre expresses gratitude"...Read more. ARTICLE: "Volunteers gather to clean up Colonial Fox Theatre" ... Read more. EVENT: Girard High School Art Exibit at the Memorial Auditorium, April 23 at 6 - 8 p.m. ARTICLE: "Five things you thought you knew about historic preservation"...Read more. ARTICLE: Main Street Face-lift - Master-plan approach opens new downtown businesses...Read more. EVENT: Sue Robinson receives the Ralph E. Wallace Award for Outstanding Contribution. ARTICLE: Future of the Fox...Officials approve renderings of the landmark's restoration...Read more. ARTICLE: Destination for Dreams...closer to vision of restoring Colonial Fox...Read more. ARTICLE: The Colonial Fox Theatre Foundation makes The Morning Sun's 2011 "honorable mentions" list.